As an educator who is addicted to Twitter I have always read about students getting introduced to Twitter and wondered how it would work. After reading and reading I have finally decided to give it a go. Here is my introduction to Twitter in my classroom. Last Tuesday, the day started like any other. Roll call, discussion, introduction to an activity and a bit of a laugh with my Year 7 and 8 Technology class. We had been discussing the importance of being an active online user and being a positive digital citizen (the students are preparing some presentations for Year 2-3 children later in the term). The conversation moved into learning environments and we discussed the small and “un-student friendly” (their words) environment that they were currently sitting in. On rolled Monday 5th May and in our first class (I see this group twice a week) we decided that tomorrow would be the day, we would ask twitter for their advice on “What makes a GREAT learningenvironment?”. The students already have some fantastic ideas and a plan of where they want to see their environment heading but they needed some depth to their plan and some other opinions outside of their little bubble. 9.30am Tuesday 6th May – The students run in with excitement written all over their faces. 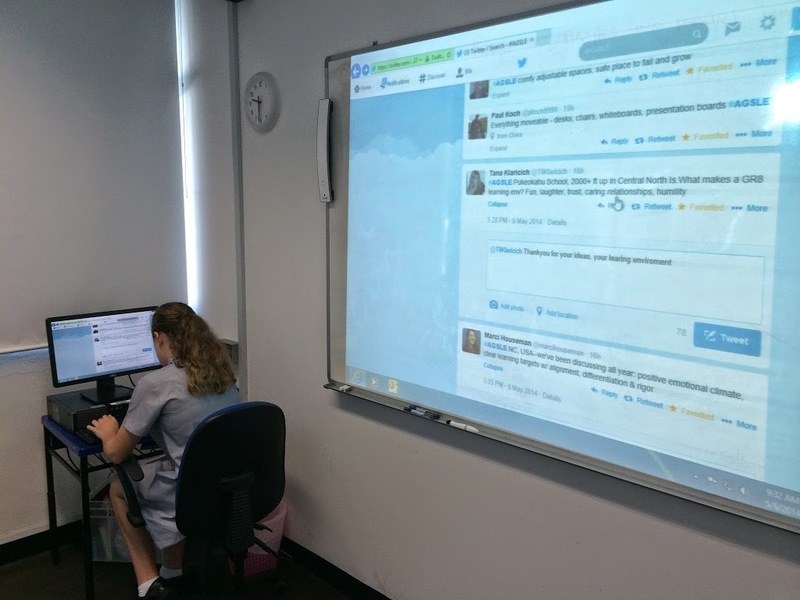 Up on the interactive whiteboard is my twitter profile with the hashtag #AGSLE up on the stream. Last night I had asked some of my amazing PLN to share their thoughts, ready to inspire the students in live time. The session began and the students led the hour. They decided they would post questions and respond to answers in their own words, using their initials. The discussion continued for an exciting hour and the students were engaged and focused. They saw a new post appear and the next student hopped up to respond. While this was going on the rest of the class were using their 1:1 device to continue researching learning environments. They are now putting together a plan of what it might look like (first draft to present to Head of School) and using links and ideas to engage their imaginations as they were shared by my amazing PLN. 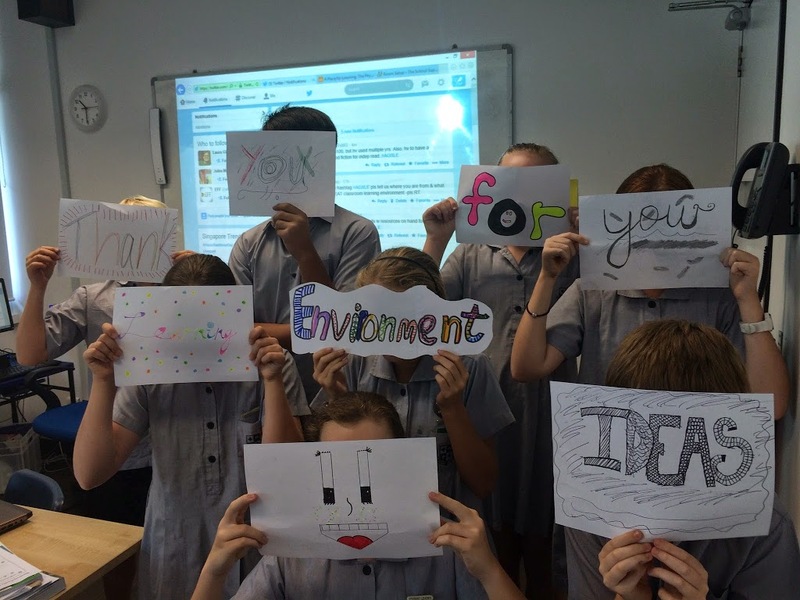 They were sent links, images of classroom spaces and ideas that made my mind spin – what an opportunity! Stay connected, follow this blog and connect with me via twitter @mrkempnz – I can’t wait to read about your first twitter experiences with students and hear your response to my exciting first dabble using Twitter in the classroom. Excellent post. As a fan of student collaboration outside the classroom (literally & figuratively) I have been using social media to teach environmental education using projects like #KindergartenBioBlitz, #KndSpring & #BirdTweeting using Twitter and Padlet. Students become more engaged as the learning becomes global using these tools I find. Keep it up! Thanks for sharing your experience using Twitter in the classroom. I started using twitter with my students along with our classroom blog, but I have the feeling that I went only halfway through and could have experienced greater outcomes if I made it part of our class. So it is nice to read how other teachers are introducing it. Thanks again. I love how you showed the feed on the board and allowed students to posted directly to it. It makes me think of journaling and how if a student says, “I don’t know what to write” their thoughts can be spurred by the posts. It also forces the students to be concise in their explanations as they only have 140 characters to use. I love how you just jumped in & gave it a try. Risk-taking often pays of in big ways! Good luck! And I thought I had seen it all in edu inspiration land! Thanks so much for sharing! Great ideas! It is nice that they also introduce twitter in the classroom. I am sure many student will going to be interested using it. I just will they use it in purpose. Keep posting. This is awesome! I have been hesitant too and wasn’t quite sure how to incorporate. Thanks for the ideas and confidence! Great Experience!!! Twitter in class…It’s great fun.I’m glad to reading this post.Thanks for sharing.